Is it Teri S. Wood or Teresa Challender? I did a lot of work under that name. And I am extremely proud of all of it. I had particular fun turning my last name into the character “Wood” for my comic strip, “The Cartoonist” which ran in the back of AMAZING HEROES magazine from 1989 thru 1992. I poked fun at everybody in the industry, from Neil Gaiman on down. 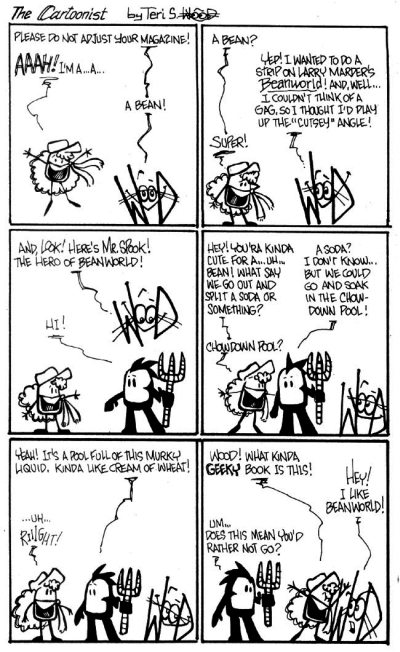 And my characters, Silver and Wood, had this little back and forth with another AH contributor, Dave Strom/STROM’S INDEX, which had me chuckling every, single month. 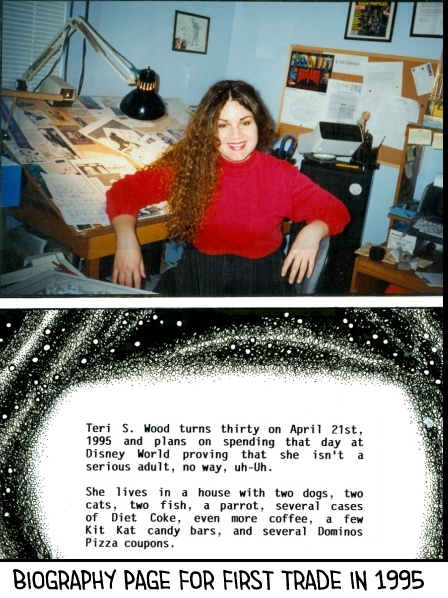 And later, of course, “Teri S. Wood” was the name I had when I launched WANDERING STAR in 1993. In 2008, I changed my name to Teresa Susan Challender, to distance myself from my birth family. I glossed over the reasons why, at the time. 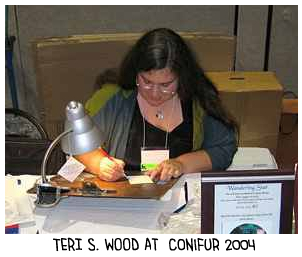 But now that I am reclaiming my birth name of Teri S. Wood, as my author name, it's important that I be clear. I am writing this, so that no fan of mine will ever fall victim to either my mother, or my brother. As a fangirl myself, I know how easy it is to want to be friends with anyone connected to those I admire. But in my case, it is not safe. To Be Brief, I grew up in an insanely, abusive family. I tried to leave multiple times between ages 18 to 30. But each time I did, my father and mother threatened me, implied they'd hurt anyone who tried to help me, and/or promised to kill the family pets. And for the record, my brother is cut from the same cloth. It was several years after my father finally died, that I finally got free. And it was not easy. My mother and her boyfriend did everything in their power to prevent it. 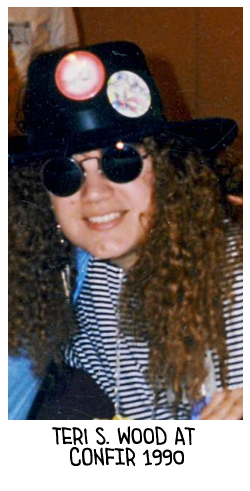 That was June of 1995. And I have not spoken to my mother, nor my brother, since. Much later, in 2008, and after much thought, I changed my name to “Teresa Susan Challender” to further distance myself from my birth family. It was both a joyous and freeing event, and a sadness, because I was also distancing myself from everything I created as Teri S. Wood. And, that is how I became “Two People” -- Resa (Teresa) Challender and Teri S. Wood. And to anyone reading this, who is growing up with The Crazy People, I've learned this: Yes, there is Life After The Family. You can go on. As Jared Padalecki says, "Always Keep Fighting." One last comment: I do not remember 1985. I have various small snippets of something very bad, related, possibly, to San Diego. To this day, I have nightmares about it at least once a week. And it is my deepest hope that someone, someday, will tell me where I went. All sorts of art projects -- newspaper ads, art, murals and logos for Imperial Valley Area stores, and Central Union High School, circa 1981-83. WANDERING STAR, small press issues, circa 1988-89, from my own publishing company, Pen & Ink comics, El Centro, California. THE CARTOONIST, comic strip for AMAZING HEROES magazine, Fantagraphics, circa 1989-1992. RHUDIPRRT: THE PRINCE OF FUR (writer Dwight Decker) for MU Press, Publisher Edd Vick, issues 1-6. Later, returned to write and draw it with my cousin, Jatina Challender, for issues 9-12. Various Projects spanning 1989 to 1999, far too many for my poor brain to remember. WANDERING STAR, the twenty-one issue series, circa 1993-1998. DARKLIGHT, two shorts in 1994, and 1997. And three issues in 1999, from Sirius Entertainment. A series I hope to return to some day soon. Various other projects since then. Yup. And hopefully more to come! John Northey's - Teri Sue Wood Fan Page and FIAWOL’s TeriWoodFans on Yahoo Groups. And, lastly, but not the least, you can be find me online on FACEBOOK, TWITTER, DEVIANTART, TUMBLR (somewhat defunct), and My BLOG. Feel free to drop by and say, “hello”. And if you made it this far, you rock. I luvs ya! Many huggles!